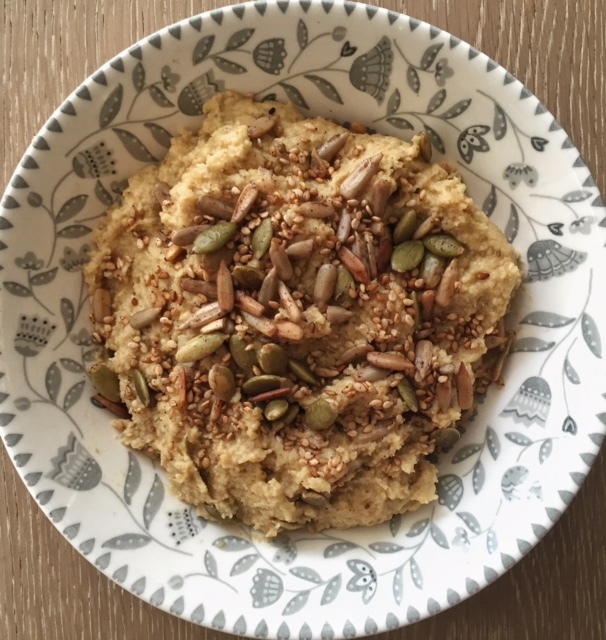 Last week I made a quick hummus with pan fried mixed seeds and a few other ingredients. Super easy to make (you could use any variety of seeds and leave out the salt) so I thought I’d share this with you. 1 x 380g Carton of Chickpeas in water. Drain. 1/2 Cup Organic, Unfiltered, Extra Virgin Olive Oil (you any organic olive oil) (I put 1 cup earlier. Think I used 1/2! .. Will make again soon.) You can see why I don’t share here before it’s made again/double checked for the blog. Ha. I make new things all the time and often write it down too fast or don’t check the cups I’m using clearly the first time! 1/4 large garlic clove or a very small whole one. Go easy or you will overpower the hummus! Blend together in a high speed blended, using tamper tool OR in a food processor. This looks and sounds delicious, I will be having a go at this simple and easy recipe this weekend. I will let you know how I get on. Looks delicious, will make some this week. Thanks Joy. I have a creamy green lentil one coming soon as well!